Distributed and dispersed generation technologies generate electricity near the particular load they are intended to serve, such as a residential home or commercial building. EIA defines distributed generation (DG) as being connected to the electrical grid and intended to directly offset retail sales, and dispersed generation as being off-grid and often used for remote applications where grid-connected electricity is cost-prohibitive. Dispersed generation in the buildings sector is not currently gathered by EIA electricity surveys or modeled in the National Energy Modeling System (NEMS), largely because of the difficulty in tracking installations and consumption. One form of DG is combined heat and power (CHP), which reuses waste heat from on-site generation for purposes such as space heating and water heating. Such technologies are typically used in both commercial and industrial sectors. The following information focuses on how EIA models DG, including CHP, in the residential and commercial sectors. Within NEMS, DG is characterized as residential or non-residential. For modeling purposes in the Annual Energy Outlook 2013 (AEO2013), all non-residential, non-CHP installations are attributed to the commercial sector. 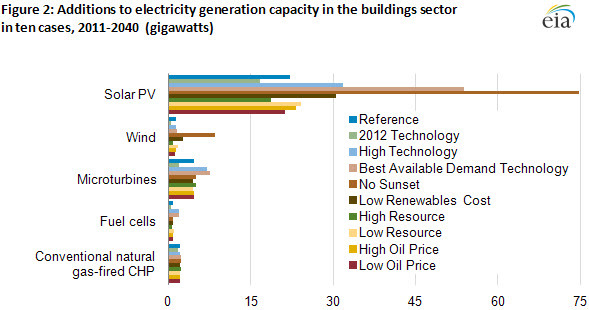 DG in buildings includes renewable and non-renewable energy generators as outlined in Table 1. The residential and commercial demand modules of NEMS project capacity and generation of DG and CHP technologies. These projections are developed based on the economic returns projected for such equipment. 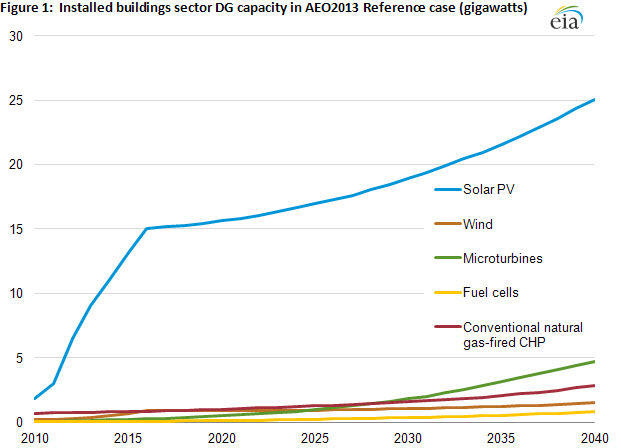 Figure 1 shows the projected capacity of DG technologies in the AEO2013 Reference case. The modules use a detailed cash-flow approach to estimate the internal rate of return for an investment (commercial) or years to positive cash flow (residential). Penetration assumptions for DG and CHP technologies are a function of the estimated rate of return relative to purchased electricity. In general, capital costs are characterized on a per-kilowatt basis minus available incentives. The demand sectors of NEMS operate at the Census division level but attempt to account for the wide variety of resource estimates, electricity and natural gas prices, and interconnection policies at more local levels. The variety of utility, state, and local incentives for DG are not explicitly characterized, but historical benchmarks ensure that the impacts of proven incentive programs are included in the model. Technology cost projections incorporate a concept known as "technology learning," which assumes that cost declines may be expected as markets for DG technologies grow. For instance, EIA assumes in AEO2013 that residential solar photovoltaic costs decrease 13 percent with every doubling in installed capacity. In this way, capacity increases can lead to projected cost reductions. However, the model also refers to a set of menu costs that represent a minimum assumed level of cost reduction, and operates with this cost if it is lower than the cost produced by the technology learning function (learned costs). In addition to the Reference case, EIA produces several side cases that show the impacts of altering assumptions of various capital cost paths, technology learning, federal incentives, and fossil fuel costs. These cases were analyzed in integrated runs with the NEMS demand and supply modules and thus include supply responses to the altered consumption patterns of the side cases. Existing annual capacity estimates are also input into the model to benchmark to recent history. Although changes are underway to increase coverage, EIA does not currently collect capacity or generation data for all small distributed generators through surveys. For this reason, EIA relies on third-party sources to estimate historical capacity. For solar photovoltaic capacity, EIA depends on the published Interstate Renewable Energy Council (IREC) state-level annual installed capacity estimates that are based on information from state agencies, utility programs, or incentive administrators. After removing the utility-scale capacity allocated to the electric power sector, these state-level totals are aggregated to the Census division level for NEMS inputs. Sectoral breakouts are then applied to these totals based on information in reports from the Solar Energy Industries Association (SEIA). For wind, EIA uses the Small Wind Turbine Market Report with national estimates of installed capacity published annually by the American Wind Energy Association (AWEA). The historical reliance on third-party estimates of capacity reflects the inability to measure installed capacity for distributed generators using data collected through EIA surveys of the electric power sector. Recently updated survey methodology may allow EIA to calculate a lower bound of the installed capacity. Form EIA-860 captures utility-scale installations (i.e., where plant capacity is greater than or equal to 1 megawatt) while Form EIA-861 captures net-metered installations of both distributed and dispersed generation in the residential sector and commercial/industrial sectors. Again, for modeling purposes, all non-residential, non-CHP installations are attributed to the commercial sector. DG technology costs are generally characterized by an installed system cost including the main generating equipment (modules, turbines, generators, etc. ), balance-of-system components, and installation and permitting costs; replacement cost for major components such as inverters; and ongoing annual maintenance costs. EIA generally uses current and projected costs provided in contracted reports which are based on literature review, industry analysis, and discussions with manufacturers, distributors, and installers. The installed system cost is characterized on a per-kilowatt basis, with typical system sizes assumed for each sector and technology type. The generating equipment and ancillary equipment (i.e., inverters) have separate expected lifetimes, as inverters typically do not last as long as the generating equipment. Inputs are provided as costs before any incentives. Since NEMS operates at the Census division level, incentives available at the utility, state, and local levels are not directly included. Federal tax credits are assumed, however. Investment Tax Credits (ITCs) created by the Energy Policy Act of 2005 (EPACT05) and continued by the Energy Improvement and Extension Act of 2008 (EIEA08) help to foster the growth of DG capacity. PV, wind, and fuel cells receive a 30-percent tax credit, while engines, turbines, and microturbines receive a 10-percent ITC. Consistent with current law, existing ITCs are set to expire after 2016 in the AEO2013 Reference case, with the exception of a 10-percent credit for PV in the commercial sector continuing indefinitely after 2016. The residential and commercial modules use different criteria for determining levels of DG adoption. The residential module evaluates costs (after incentives) on number of years to net cumulative positive cash flow relative to purchasing electricity. That positive cash flow must be persistent. In other words, if positive cash flow is first achieved based on receipt of a tax credit but loan payments and inverter replacement cost force the net cumulative cash flow negative, the earlier positive cash flow is not considered persistent. The commercial module evaluates costs after incentives based on internal rate of return (IRR) using a 30-year cash flow analysis to determine payback period for the different DG technologies. Penetration assumptions are a function of this estimated IRR relative to purchased electricity. These different approaches are intended to reflect the differing methods used by individuals and businesses when making investment decisions. The DG submodules incorporate interconnection factors based on state-level policies that are intended to reflect the relative ease of contracting, constructing, and interconnecting DG. More than 40 states have some form of interconnection standard or guideline that governs how much DG capacity can be installed and incorporated into the electricity grid. The Database for State Incentives for Renewables and Efficiency (DSIRE) maintains a summary table for rules, regulations, and policies for renewable energy. This table is used to generate a state's score (out of 100) based on the presence of each of the policies listed in Table 2. Some states, such as California, had all of these policies and therefore received a score of 100. Other states, such as Tennessee and Idaho, only had one policy and received low scores. Only two states, Alabama and Mississippi, had no state-level policies and therefore received scores of zero. These state-level scores are then population-weighted up to the Census division level, translated into shares between 0 and 1, and used to limit the penetration of DG in each division. These limitations are lessened over time based on historical rates of change in state-level interconnection policies. Census divisions comprise the finest geographical detail of the NEMS residential and commercial demand modules. However, factors affecting the penetration of DG technologies can vary widely within a Census division. For example, the Pacific Census division, which includes Alaska and Hawaii in addition to California, Oregon, and Washington, represents a wide variety of energy prices and climatic conditions. Average conditions for a Census division may not appear to support economic penetration of these technologies, while actual economic penetration could be quite robust based on local conditions in niche areas. Niche data were derived from RECS 2005 and CBECS 2003 by overlaying climate zone maps for each Census division with solar insolation and wind speed maps. Rather than develop niches based on state-level borders, resource niches are loosely based on subregions with similar climate conditions, as defined by heating degree days (HDDs) and cooling degree days (CDDs) provided in the consumption survey observations. These subregions were then mapped to their estimated solar insolation and wind speed. Within these resource niches, the microdata observations were further mapped into sub-niches representing below-average prices, average prices and relatively high prices. Each niche includes the share of households and floorspace within the Census division for the residential and commercial sectors. Separate niche-level scaling factors for electricity prices and natural gas prices relative to the division average are applied to the projected Census division price. Finally, for PV, rough estimates of available roof area within each niche—based on building characteristics such as roof geometry and number of floors—were applied to total floorspace. The modules evaluate investment decisions and develop projected penetration for niches, then aggregate to obtain results for each Census division. Several side cases show the impact of changing certain assumptions for DG, primarily projected cost assumptions. High capital costs impact the adoption of renewable DG technologies the most, and operating (i.e., fuel) costs have a greater effect on non-renewable generation. Also, the 30-percent tax credit for renewable DG technologies provides a larger relative difference in costs than the 10-percent CHP tax credit. As a result, installation of renewable DG capacity slows dramatically and non-renewable generation capacity continues to grow steadily after 2016. In the AEO2013 High Demand Technology and Best Available Demand Technology cases, lower system costs and increased technology learning relative to the Reference case are used to drive down projected capital costs for PV, wind, fuel cells, and microturbines. Relatively more mature technologies such as diesel engines and natural gas turbines also experience decreasing system costs, but without the benefit of technology learning with increased adoption. Two other cases also modify cost assumptions: the 2012 Technology case limits technology choices to those available in 2012, implying no performance increases or cost reductions over time, while the Low Renewables Cost case assumes 20 percent lower equipment costs relative to the AEO2013 Reference case beginning in 2013 and continuing through the projection period, consistent with similar assumptions for utility-scale renewable technologies modified for this side case. Another case maintains Reference-level costs but modifies policy assumptions. In the AEO2013 No Sunset case, which continues existing ITCs through 2040, the end of the NEMS projection period, PV and wind capacity increase at average annual rates of 11.9 percent and 13.8 percent, respectively, compared to 7.6 and 7.1 percent in the Reference case. Non-renewable DG capacity for conventional natural gas-fired CHP (i.e., engines and turbines), microturbines, and fuel cells grow at 4.9, 15.0, and 10.9 percent, respectively, in the AEO2013 Reference case, increasing only to 5.0, 15.3, and 11.3 percent in the No Sunset case. Finally, four side cases show the impacts of changing assumptions not directly related to DG. These cases use Reference-level DG costs and policies, but use modified assumptions of higher or lower oil and natural gas reserves and higher or lower oil prices. The High Oil and Gas Resource case assumes more technically recoverable domestic crude oil and natural gas resources, while the inverse is true in the Low Oil and Gas Resource case. The High and Low Oil Price cases reflect a range of potential price paths for the Brent crude oil price benchmark. These two cases also reflect the impacts of low and high non-OECD (Organization for Economic Cooperation and Development) member demand growth, respectively. The effects of the individual side cases can be compared in Figure 2. Additional side case data are available in Annual Energy Outlook Appendix D, while complete side case descriptions are located in Appendix E. Extended tax credits in the No Sunset case result in the most added capacity above Reference-case levels. More optimistic costs in the Low Renewables Cost, High Technology, and Best Available Demand Technology cases also increase DG capacity above the Reference case, while the 2012 Technology case's assumption of no future changes in costs after 2012 results in fewer capacity additions. In the Low Oil Price case, non-renewable DG capacity, most of which is fueled by natural gas, generally decreases relative to the Reference case, with the opposite effect in the High Oil Price case. Capacity provides a good basis to compare DG adoption across technologies and alternative cases; however, a DG technology's contribution to electricity generation may differ from its share of capacity additions. Figure 3 shows the range of electricity generation in 2040 across side cases to illustrate the role of each technology in providing self-generated electricity. Note that, for each technology, the 2012 Technology case resulted in the lowest generation levels in 2040. The highest generation levels were projected in either the Best Available Demand Technology case or the No Sunset case, depending on the equipment type. Mature technologies such as conventional natural gas-fired CHP may be more affected by prolonged tax credits because they have already approached maximum efficiency limits, while newer technologies such as fuel cells and microturbines can experience a wider range of development and greater levels of efficiency, as modeled in the Best Available Demand Technology case.